It’s been hanging in your living room for 25 years and no matter how hard you try to ignore it, you realize that you just can’t go on with that old ugly wallpaper. It’s time for it to go. But how do you remove wallpaper? If you have no experience with home improvement, it’s best to call a professional to remove the wallpaper in your home. This type of project can be extremely time-consuming and aggravating if you don’t know what you’re doing. However, if you’re up for the challenge, below is some advice on getting the job done right without ruining your walls. 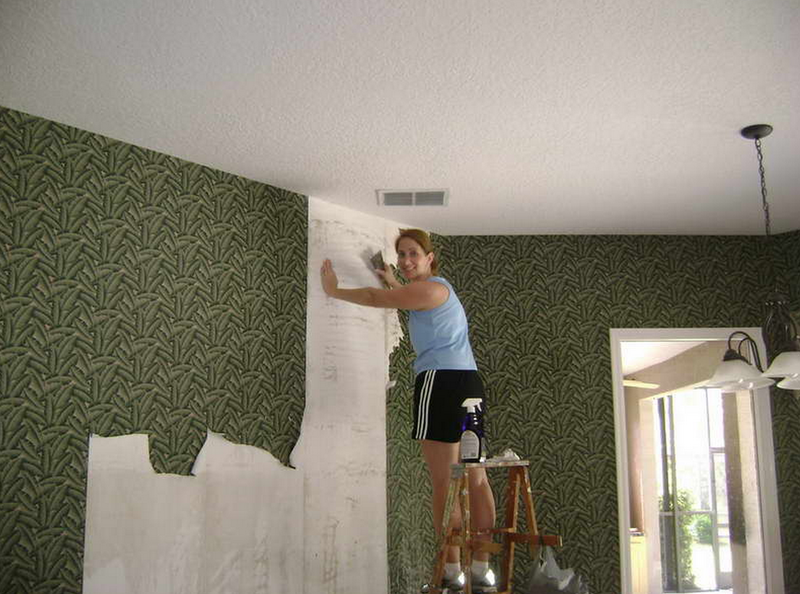 First and foremost, it’s key to understand that every wallpaper removal job is different and depends mostly on the preparation performed prior to hanging the current paper. If the previous contractor or homeowner did not properly prime the wall, or he/she hung the current wallpaper over an existing layer, the job can get exponentially more difficult. There are 2 main methods for stripping wallpaper: with chemicals or with a steamer. Using a steamer was popular a few decades ago, and they were often powered by propane (very unsafe). Today’s steamers are electric, but using them can produce varying results. Most homeowners and contractors nowadays prefer to use a wallpaper-stripping chemical opposed to a steamer. To start, you’ll want to cover the floors with a drop cloth and plastic. Before spraying any chemicals, see if you can use a putty knife to lift up a corner of the wallpaper and tear a sheet off. If your wallpaper is vinyl, you’ll most likely be able to pull off the vinyl layer leaving the paper and adhesive behind. It’s helpful to do this step first, because the water and chemical mixture wont penetrate the vinyl. Next, fill a standard garden sprayer with the recommended amount of water and DIF wallpaper stripping solution by Zinsser. This product is highly effective and preferred most by professional painters. The key to using this product is to spray a small section thoroughly at least twice (with 10 minutes in between sprayings) and make sure that the paper is always wet. Be as liberal with the solution as possible. The more you soak the paper, the easier it will be to remove. If this isn’t effective at first, you can use a scoring tool to perforate the paper and help the solution get behind the paper and loosen the adhesive. Most painters shy away from using this tool, because when you go to pull off the paper, you the paper is more likely to tear in small strips rather than large chunks. It helps to run a putty knife against the wall to lift up any stubborn paper and adhesive. Once you remove all the paper, spray the wall with DIF again and scrape with a wide putty knife to remove the majority of remaining adhesive. After you’ve removed all of the paper and adhesive, you’ll need to thoroughly wash the wall with a soap and water solution. If you don’t remove all the adhesive, the primer and paint won’t create a proper bond with the drywall. When you’re done washing the wall, let it dry and prime it with a high quality bonding primer, such as Benjamin Moore’s Fresh Start. To save yourself a finish coat, you can tint this primer to match the top-coat. Now apply a finish coat in whatever sheen you choose and enjoy your new modern room!